“Warning: this article contains the names of Aboriginal people who have died. Cecilia Alfonso and Gloria Morales come from dramatically different social, cultural and political backgrounds. In their home country of Chile they would likely have never met. They’re also not the most obvious candidates to negotiate the fraught politics and cultural protocols of a remote Aboriginal community. Yet, over the past 15 years, their blend of passion and hard-headed pragmatism has transformed the Warlukurlangu Art Centre into one of the most successful in Australia, earning the praise of the Warlpiri artists it supports. “The death of Mr Tjungurrayi, one of Australia’s most outstanding contemporary artists, in December has gone largely unnoticed outside the Aboriginal art community. 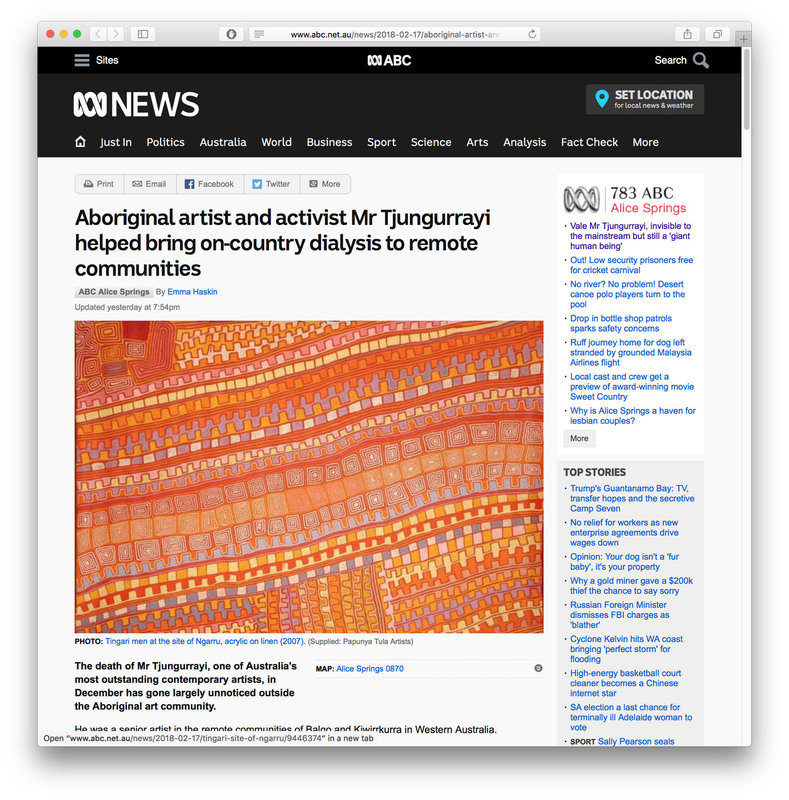 It’s really sad when someone like Tjungurrayi passes, but it also should give us real pause to reflect on the extraordinary lives and the really giant human beings who walk among us in Australia and who are often invisible in mainstream consciousness…” You can read the whole story here on the ABC web site. For thousands of years, the Wardaman people of northern Australia have had a name for the smallest of the five stars that make up the Southern Cross. They call it Ginan — a name that’s now been officially recognised by the International Astronomical Union (IAU). A painting by Aboriginal artist Peter Mungkuri has taken out the inaugural Hadley’s Art Prize, the world’s richest landscape art prize. Read the full story here on the ABC News web site. Classic small businesses, they employ less than 10 people and turnover less than $3 million. According to the ABS there were 514 of them in Australia in 2000. Today no more than 50% of these survive..